Pet One is very proud to present its newest product, Clean Canine Shampoo. 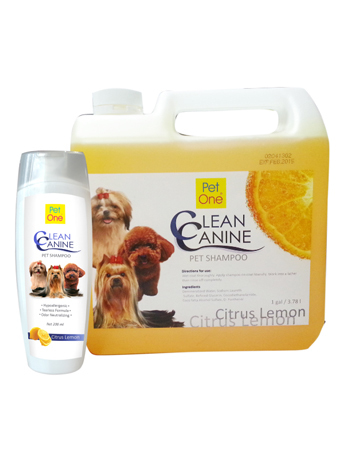 The shampoo is aptly called Clean Canine as it eliminates unwanted odor and leaves your dog with a very fresh citrus lemon scent. It is also perfect for dogs that are always being groomed as it makes the dogs’ fur softer and much more manageable. Wet coat thoroughly. Apply shampoo on coat liberally. Work into a lather then rinse off completely.